Dr. Rajeev Pandey became the Dean of Admissions at Spartan Health Sciences University on September, 2014. Dr. Rajeev, a biochemist and a Chairman of Community Health & Research Center of Spartan (CHARCOS), is a Head / Course Director & Associate Professor of Department of Biochemistry at Spartan Health Sciences University, School of Medicine and Director of BS-Biomedical Sciences (Biochemistry Major) Programme of SHSU. Dr. Rajeev is actively involved in Research, Professional Development of Faculty since 2011. He also holds the Executive Chief Proctor for NBME position since 2015 at SHSU. 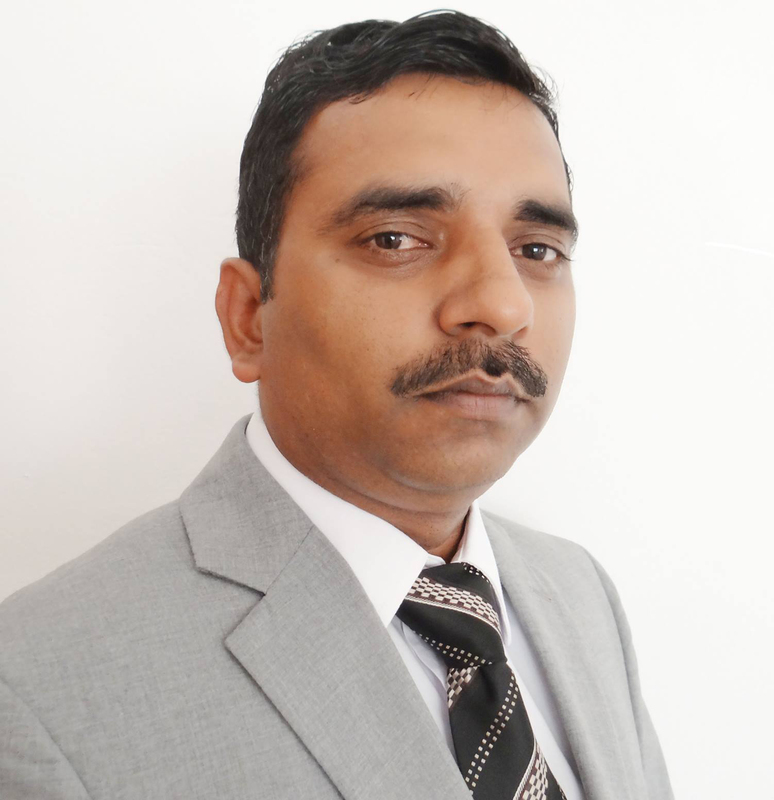 Dr. Rajeev has authored more than 39 research papers and reviews in various journals of repute. He published 12 research / review papers at SHSU and approximately 08 publications are in pipeline for publication. Previously, he had served as faculty at American Institute of Medicine in Seychelles and College of Medical Science & Technology in India. Dr. Rajeev also worked as Scientist at Department of Science & Technology, India and has vast experience in Intellectual Property Rights, Medical Research and funding. Dr. Rajeev was raised in the north region of India and received his Ph.D. in Biochemistry entitled “Studies on the Photo-toxic & Photohemolytic Potential of Commonly used Antibiotics” from Dr. R.M.L. Avadh University, India. Prior to re-joining academic, Dr. Rajeev was actively involved in strategy development for IPR & medical research, facilitation of meetings or consultation. He has worked with Department of Biochemistry, Dr. R.M.L. Avadh University, India and taught Clinical Biochemistry in PG Diploma in Clinical Biochemistry & Pathology programme. Dr. Rajeev has done series of General Course on Intellectual Property Rights offered by World Intellectual Property Organization, Switzerland. Dr. Rajeev was fellow of Council of Science & Technology & Department of Science & Technology, India. Rajeev Pandey, Gurumurthy, Jesse Galinski, Andrew Haddad, and Payal Dhaduk (2015). Stereotactic Body Radiation Therapy: A Review of Applications and Outcomes. Nucl Med Radiat Ther, 6:4. Rajeev Pandey, Jesse Galinski, Jamee Charles, and Gurumurthy (2013). Examination of the Synergistic Relationship of Diabetes and Depression. Biochemistry & Physiology, 2:3. Dr Rajeev Pandey, Maxceline Aghen, Jamie Dubose, Kaishia Joseph, Thea Recai and Amelia St. Agne (2013). The where and how of cancer vaccines. Heartbeat. Issue. April, 2013. R Pandey, Sambasivarao Y and Gurumurthy (2013). Antibacterial Activity of Medicinal Plants against Pathogens from Extracts of Achyranthes Aspera. Medicinal & Aromatic Plants. 2:5. Sambasivarao Y, Jasmin Ahmed, Benjamin Kuska, Rajeev Pandey, Gurumurthy (2013). PCR Analysis: Detection of Bacteriophage Contamination in Biotechnology used to Produce Recombinant drugs. Journal of Science, Vol. 3, No.1, pp. 201-204. Science, technology & the future of medicine, Dr Yaragalla Sambasivarao (2013). Issue, April 2013. Dr Rajeev Pandey, Jamee Charles and Jesse Galinski (2013). The synergistic relationship of diabetes and depression. Heartbeat. Issue. April, 2013. Pandey, R. and Gurumurthy (2012). Resistin, is there any role in the mediation of obesity, insulin resistance & type-II diabetes mellitus? West Indian Medical Journal. A Report – CHARCOS UPDATE (2012) Heartbeat. Issue. Nov.-Dec., 2012. A Report – SHSU Inaugurates the Community Health and Research Centre of Spartan (CHARCOS) (2012) Heartbeat. Issue. July, 2012. Pandey, R.; Yarragalla, S. and Gurumurthy (2012). Antibacterial Activity of Different Organic Extracts of Achyranthes Aspera. Asian Journal of Tropical Medicine. Pandey, R.; Singh A. K. And Gurumurthy (2012). Resistin, is there any role in the mediation of obesity, insulin resistance and type-II diabetes mellitus? Journal of Stress Physiology & Biochemistry. K. Gupta; A.K. Mishra; R. Gaur; R. Pandey & U.K. Chauhan (2009). Studies of Genetic Polymorphism in the isolate of Fusarium Solani. Australian Journal of Crop Sciences. 3(2):101-106 (I.F. 1.132). Rana, A. Tripathi & R. Pandey (2009). Intellectual Property Rights. Industrial R&D Highlights. Rana, A. Tripathi & R. Pandey (2008). Consequences of Global Warming. Our Earth. Mehrotra S.; Gupta A.; Singh S. & Pandey R. (2006). Evaluation of Phototoxic Potential of Selected Drugs in terms of Singlet Oxygen Generation under UV Stress. Advances in Pharmacology and Toxicology. Volume 7(1):55-62. Singh, S. Mehrotra, R. Pandey & R. Sandhir (2005). Hepatoxic effects of tert-butyl hydroperoxide (t-BHP) and protection by antioxidants. Indian Journal of Experimental Biology. Vol.43(8) : 728-731 (I.F. 0.551). Gaur R.; Pandey R.; and Kumar A. (2003). Inhibitory effect of essential oil of Achyranthus aspera against phytopathogenesis. Science and Culture. 70. (3-4). 165-166. Pandey R.; Mehrotra S.; Ray R.S. ; Joshi P.C. & Hans R.K. (2002). Evaluation of UV Radiation Induced Singlet Oxygen Generation Potential of Selected Drugs. Drug and Chemical Toxicology. 25 (2), 215-225. (I.F. 2.92). Pandey, et.al. (2002). Proc. Intl. Conf. on Environmental Threats to Health of Children (WHO). Chulabhorn Research Institute, Bangkok, Thailand. March, 3–7. K. Dwivedi & R. Pandey (2001). Iodine as a tool for water treatment. The Green Trend. March–April. Gaur; N. S. Darmwal; M. K. Gaur; R. Pandey & and N. Mehrotra (1999). Effect of soil solarization on the reduction of Pythium ultimum and damping – off of Linum usitatissimum. Acta Botanica Indica. Vol. 27; 31-33. Gaur; N. S. Darmwal; M. K. Gaur; R. Pandey & and N. Mehrotra (1999). Effect of incubation periods and temperature and free amino acids production by Trichoderma harzianum, a biocontrol fungus against Rhizoctonia solani. Acta Botanica Indica. Vol. 27; 205-207. Pandey,et.al. (1998). Hindustan Antibiotics Bull., 40: 59-61. Biodeterioration of Ind. & Food Products. R. Gaur, N.S. Darmwal & Pandey. Env. Microbiology & Biotechnology edt. by D.P. Singh & S. K. Dwivedi (2003) New Age Int. (P) Ltd., Publishers. N. Delhi.